In the floral industry, there’s increasing recognition of the importance of cold temperatures — and providing cold temperatures for every flower from the point of harvest to the point of sale. (One notable exception to this rule: tropical flowers.) And, just for clarity, "cold" means 34 F to 36 F.
Why is the cold so important? Low temperatures extend vase life and optimize the performance of cut flowers. Moreover, cold temperatures are easily managed by adjusting the thermostat and monitoring the temperature in the cooler. Sounds simple enough, right? In theory, yes, but in reality, and for various reasons, it is not unusual to observe flower shop coolers at 42 F to 45 F. Those higher temperatures reduce flower life, which can lead to disappointed customers. Why does cold temperature have such a big influence on the performance of flowers? Three factors help explain the science. Flowers use stored sugar and starch to maintain the structure and function of cells in the flowers, leaves and stems. Sugars provide the energy for flowers to open and to extend flower life. Without sugar, cells starve, blooms fail to open, and death occurs prematurely. Cold storage temperatures lower the respiration rate and allow sugars to be conserved. 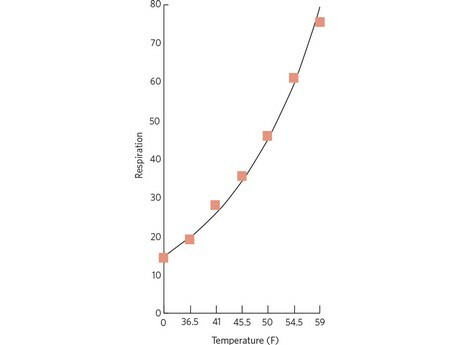 See the graph for an illustration of how rapidly consumption of sugars and starch increase as temperatures rise. Flower foods provide sugar to supplement the stored sugars used by the flower during storage, shipping and handling. Ethylene kills flowers. At cold storage and shipping temperatures, however, flowers are less sensitive to atmospheric ethylene and do not produce as much ethylene internally. In fact, flowers are 1,000 times more sensitive to ethylene at 65 F than they are at 35 F.
The spread of diseases such as botrytis on flower petals and growth of microbes in bucket and vase solutions are reduced significantly at cold temperatures. Botrytis spores grow and destroy flowers rapidly at warm temperatures. These spores are not killed by cold temperatures, but the spread of the disease is much slower. Microbes block the flow of water up the stem. Microbes present in bucket and vase solutions grow much faster in warmer water. Realizing how cold temperatures affect respiration, ethylene and disease makes it possible to extend the life of flowers. But temperature is only one of the key factors in flower life. 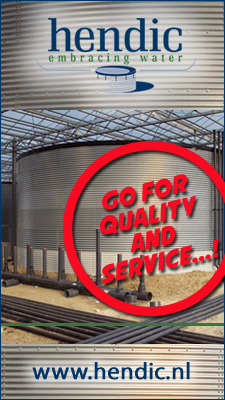 Equal priority needs to be placed on the other factors affecting the absorption of water, particularly scrupulous sanitation, ethylene management and the use of properly prepared hydration and flower food solutions.